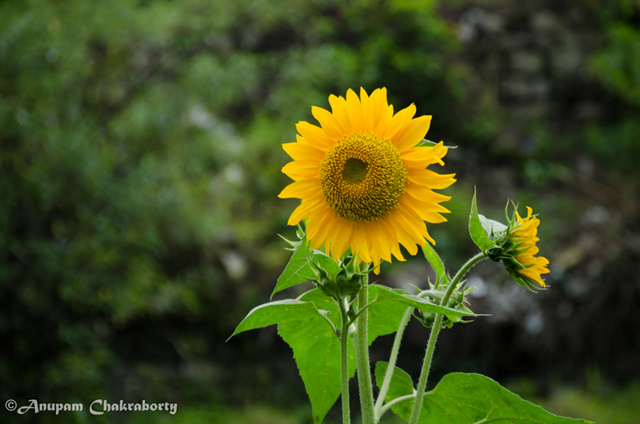 The Road To Valley of Flowers - Ghumakkar - Inspiring travel experiences. No human soul lives around the valley though it is not soulless completely! The valley remained unknown to the world until 1931, when arrived there like Alice in Wonderland, six British Mountaineers, who lost their way while returning from a successful expedition to Mt Kamet. Numerous wild flowers cover the Valley in monsoon and create a magical sight of a wonderland. Frank S. Smythe, one of the six British mountaineers, while mentioning about the Valley wrote, “it was impossible to take a step without crushing a flower”. 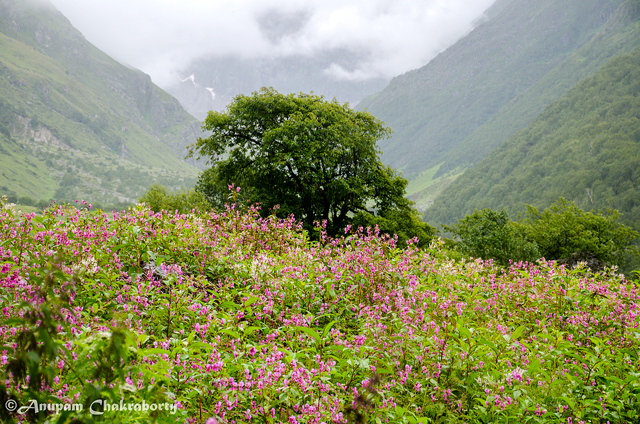 They named it the Valley of Flowers and thereafter the valley has become a popular place for summer expedition. 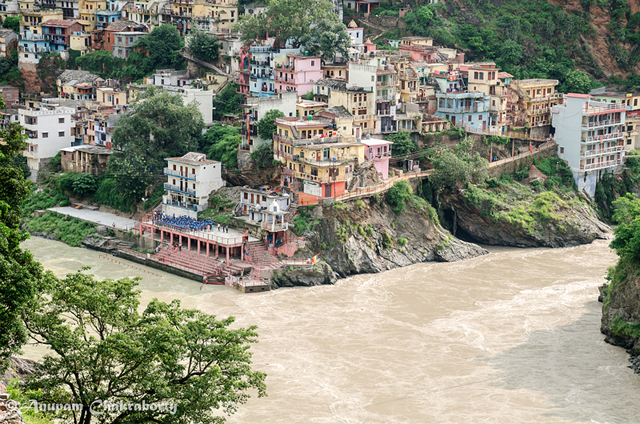 Along the Ganges, the road from Rishikesh goes 70km ascending all the way to Devprayag. Prayag is the confluence of rivers. 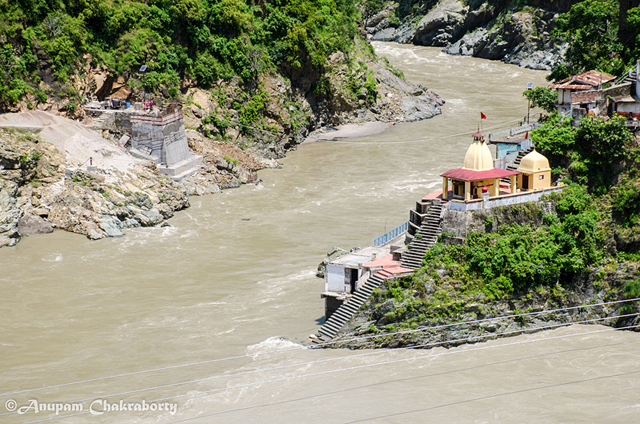 Devprayag is the place where river Bhagirathi and Alakananda meet. From this point of convergence, river Ganga takes its name and flows downward. 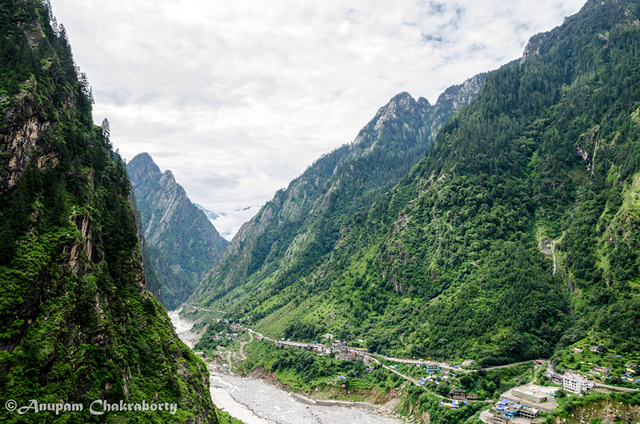 Originating from Gomukh, river Bhagirathi is flowing down from the left (in the photo below), meets here with river Alakananda which is flowing down from the right (in the photo below) from Satopanth Glacier above the Badrinath valley. Devprayag is one of the Panchaprayags (five confluences). All five prayags fall on the road which goes to Badrinath or Valley of Flowers. 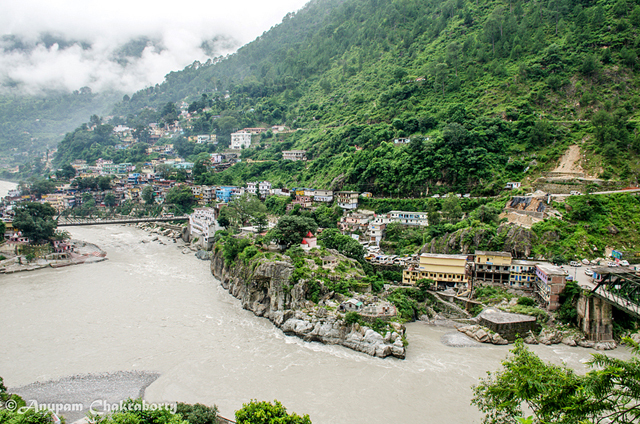 Dhari Devi Temple: On this road ahead, falls the next confluence called Rudraprayag. We reached a village called Kalyasaur which is located 19 Kms before Rudraprayag. 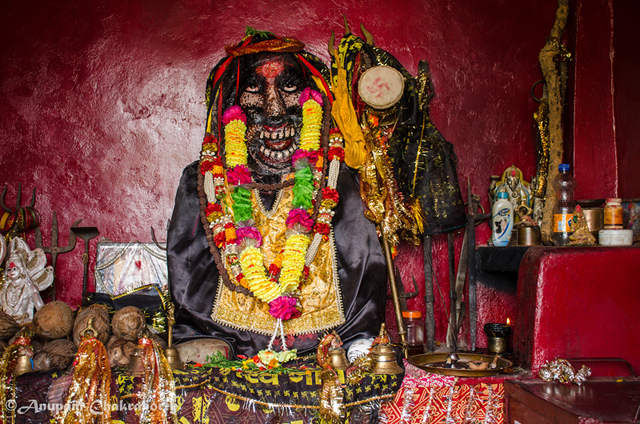 This place is famous for a very pious temple of Goddess Kali also known as Dhari Devi. 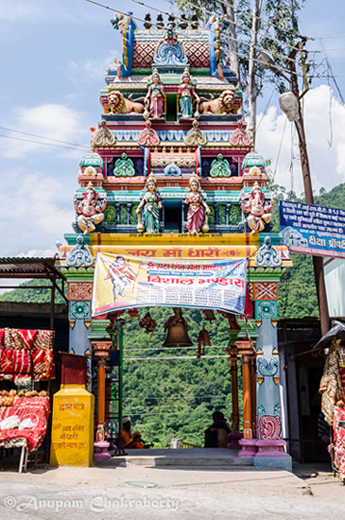 The entry gate of the temple lies along the highway to Badrinath, and a narrow path down to the river Alakanada took us to the temple. Originally the temple was 30 meter down from its present height. For construction of a dam, the temple was elevated and the idol of Dhari Devi was relocated in the present elevated temple. The locals believe that, it was due to this relocation of the idol of Dhari Devi, the devastating flood took so many lives after the cloudburst near Kedarnath Temple in 2013. Construction of this temple is yet to be finished though visitors are allowed to worship. Photography inside the temple is prohibited. But the image of Goddess Dhari Devi is wonderful to behold. On our way back, we visited a small temple of Bhairo Baba which lies along the same path. The next prayag to come was Rudraprayag! We set off again and soon reached there. It is the confluence of river Mandakini and Alakananda. 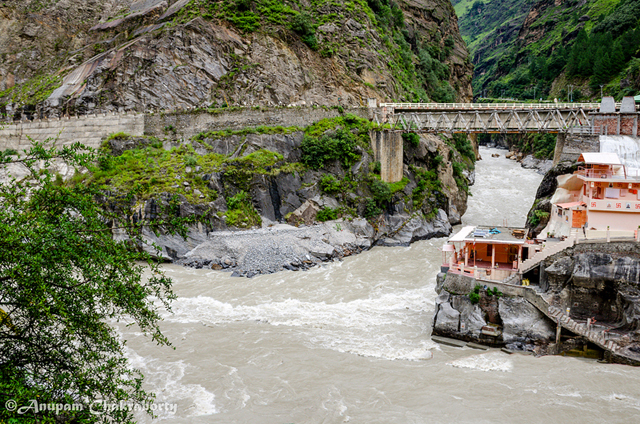 Originating from Kedarnath, river Mandakini is flowing from the top (in the photo above) and meets here with Alakananda which is flowing down from the right. The prayag next we reached was the Karnaprayag. It is the confulence of river Pinder Ganga and Alakananda. 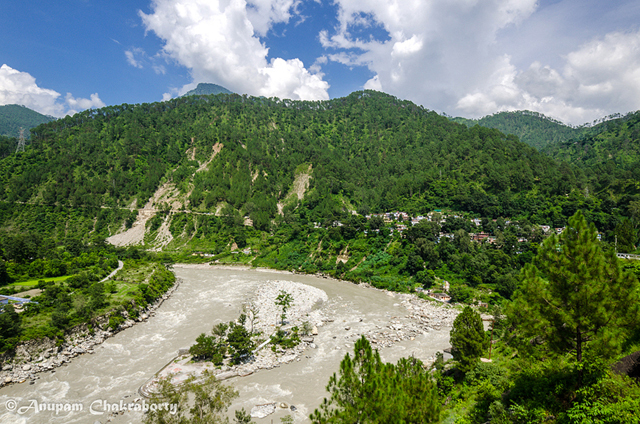 Originating from Pinder Glacier in Bageshwar, river Pinder Ganga is flowing from the top (in the photo above) and meets here with Alakananda which is flowing down from the left. These two rivers meet at a place which does not allow an easy click of the confluence. We climbed to many high points and at last found a place to capture the confluence. 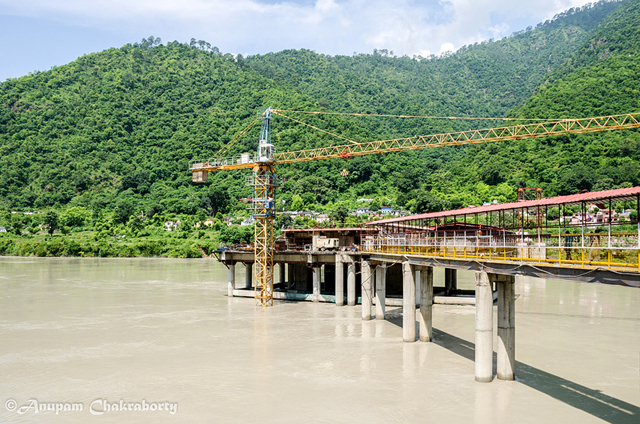 Nandaprayag was the next confluence to come. We arrived there and saw the river Nandakini, originating in Nanda Devi peaks, is flowing from the right (in the photo below) and meets here with Alakananda which is flowing from the top. We continued our journey gazing the scenic Himalayan beauties. The beautiful village ‘Gopeswar’ on a mountain top held us for a moment before we proceeded further. 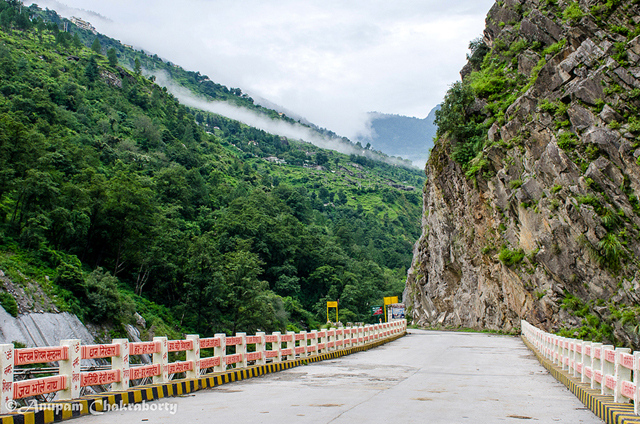 The scenic road continued ascending all the way to a beautiful mountain village called Pipalkoti. When ‘Joshimath’, our destination for the night stay, was only about 14 Kms away, we saw a perfect Z-shape road ascending towards it. Climbing all the way through the Z-shape road and crossing the beautiful waterfalls we reached Joshimath at 06.15pm. We checked in the Hotel Kamet. It is an average hotel with basic amenities and its super deluxe room cost us Rs.1100/-. 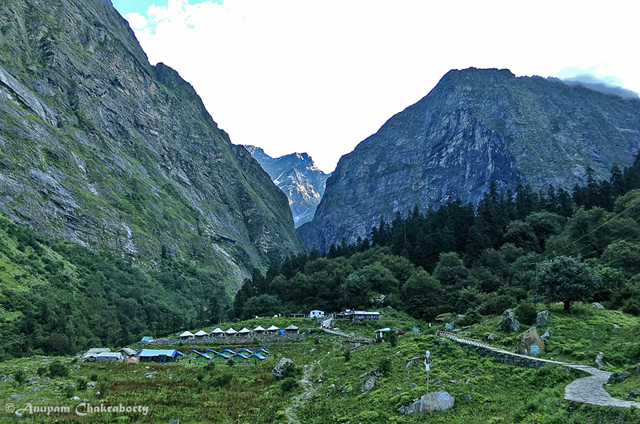 It was 6.30 in the next morning; we set off our journey to Ghangaria which is the base camp for Valley of Flowers. The nearest motor head to Ghangaria is Govindghat which lies at a distance of 24 Kms from Joshimath and falls on the road to Badrinath. Yesterday, we saw four prayags. 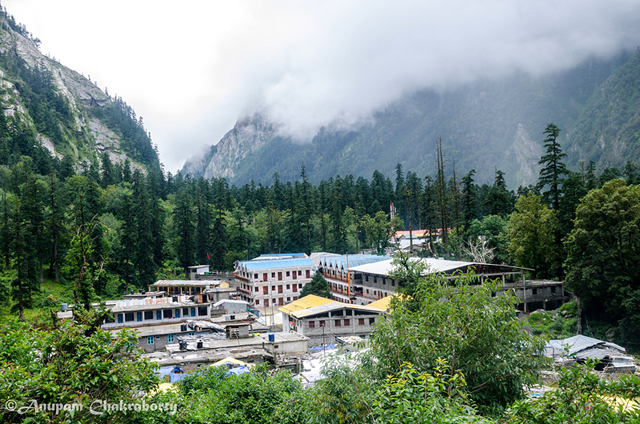 The fifth one was not too far from Joshimath and we arrived soon at the ‘Vishnu Prayag’. It is the confluence of Dhauli Ganga and Alakananda. Dhauli Ganga is flowing from Dhaulagiri Mountains (on the bottom right in the photo below) and meets here with Alakananda (flowing from the top right). 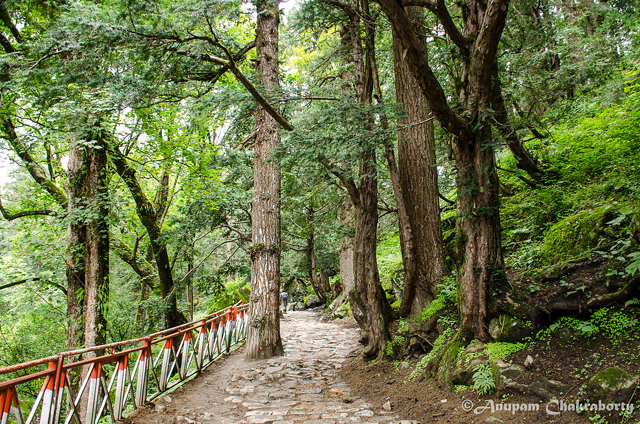 Trek to Ghangaria: We soon reached Govindghat. From here, these days, an off road goes 3Kms to a village called Pulna. We preferred to cover the distance by local Jeep. The road bifurcates here. 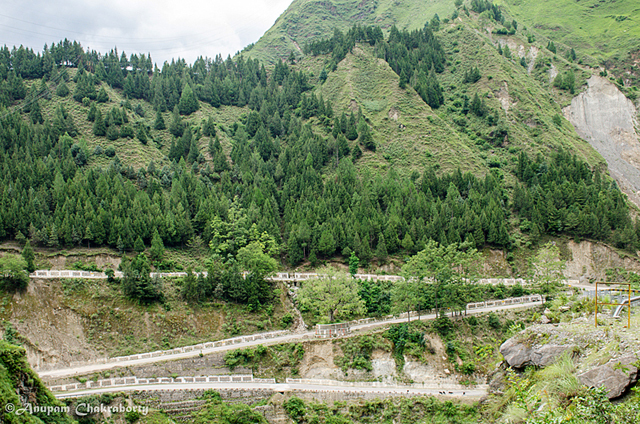 The straight road goes to Badrinath and the one going down to a settlement is Govindghat. From Pulna the trek of about 14 Km starts for Ghangaria. 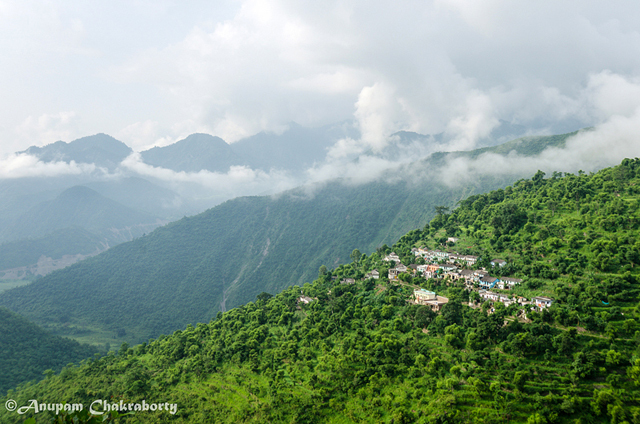 After the cloudburst of 2013, the distance of new trek to Ghangaria has increased by 1.5 – 2 Km. Not only that, it became steeper too! 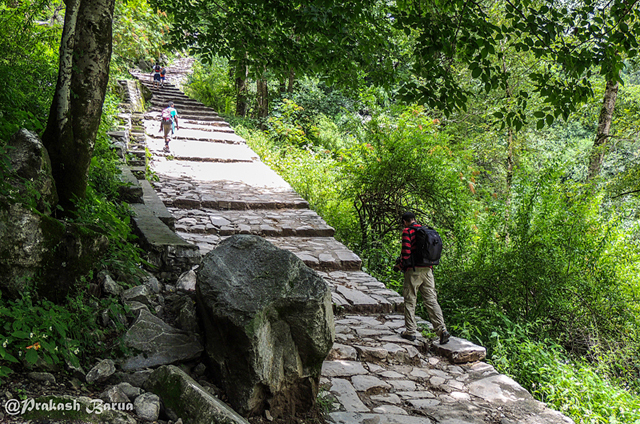 It is a narrow stone paved trail which goes along the river Lakshman Ganga. The flood of 2013 in the river Lakshman Ganga washed away trails in many places which are now substituted by steep longer roads. We went through the riverbed and crossed over the makeshift bridge on the river Lakshman Ganga before hiking the final steeper trail to Ghangaria. 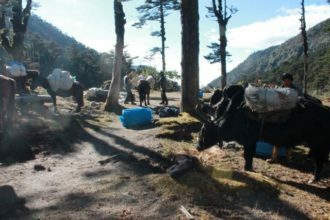 The hikes on the trek to Ghangaria were five times more than those small descends. But each hike came with an inspiration to enjoy the return journey through a relaxing downhill. With such a great inspiration we were climbing each ascend and were greeted with lesser oxygen due to the gain in altitude. Nevertheless, when your destination is a magical land, the Valley of Flowers, you accept everything whatever comes on the way! So for a little less than five hours we enjoyed (Oh really!) the hike of 14 Kms to Ghangaria and retired early to bed with a hope that the Valley would greet us tomorrow with lots of flowers on its alpine meadow. Ghangaria, the beautiful base camp of Valley of Flowers. The difficulty level of this trek from Pulna to Ghangaria is between easy and moderate. Previous articleब्रह्माकुमारी आश्रम की यात्रा व आध्यात्मिक ज्ञान के पल….! Beautiful journey… I like the Himalayan stories more .. the description is fast and pics are beautiful..
waiting for this wonderful valley.. I could never go there but I saw some flowers in Edinburgh botanical garden, brought by sister of Joan who died in the valley and has her tomb erected there itself. Sorry for the delay in response. Thank you very much! Yes, you are correct about the Botanist Joan and I went to her grave stone in the valley. Will write about that in my coming post. Do visit the valley, its heavenly! These days there is also helicopter service from Govindghat to Ghangaria. So, one can avoid the strenuous trekking route. But from the base camp Ghangaria to the Valley of Flowers, which is a 6 KM trekking, though arduous but achievable. More details will follow in the coming continuing part. Thank you! THIS IS FOR NANDAN JHA !! and-Lo the whole comment disappears. again. The script shouldn’t get wiped out– Normally only the answer needs to be redone? Its difficult to figure out whether the sign is +,-.or what. Hope I do right this time-6+..
Jatinder Sir – Apologies for the inconvenience and the annoying question. This is done to avoid the spammers (though they still manage to get in). If you log in and then comment then it wont ask the question. Also, you would see much less of advt. My point was different,and,may be, I was not able to express myself..
My point was :-that if I give wrong answer, then the Captcha image should get replaced with the new image–But-the comment stays put-Any number of times. But in Ghumakkar case if the Captcha image is wrongly copied then the comment also disappears, And the writer has to write his comment again and again. In all other cases, only the Captcha image keeps changing till you have answered it correctly..
Can I come in, Jatinder Ji? What I do is that I select all what I typed in the comment box and then by pressing Ctrl+C, I copy that and if required, in my next attempts, I paste it by pressing Ctrl+V key. I avoid double typing in this way. Thank you. Its very kind of you and Nandan to pay attention to my silly problem(I am still learning–never too late).Thanks for the suggestion. Will certainly try your rout next year–Inshah-Allah ! Very nicely described and with great photographs. Loved the Prayags. 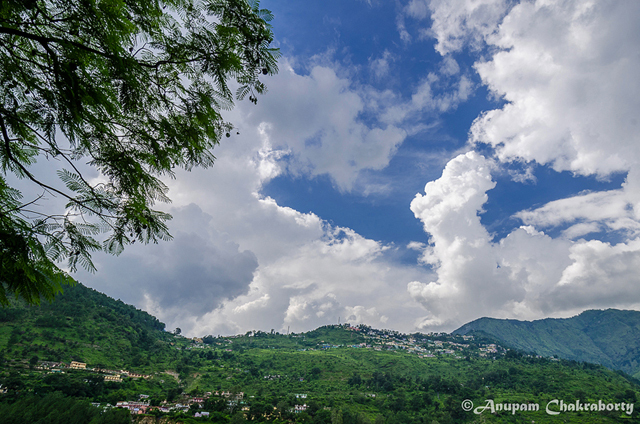 Nice post Anupam, Description is good and all pictures are simply awesome.I was there in 2011. Thanks for sharing. Hi Naresh! Thank you very much! Beautifully illustrated. I have been wanting to visit this gorgeous place…..seems time to put plan into action. My best wishes for your trip to the Valley, Bela! Glad that you liked it! Thank you. I loved this post! 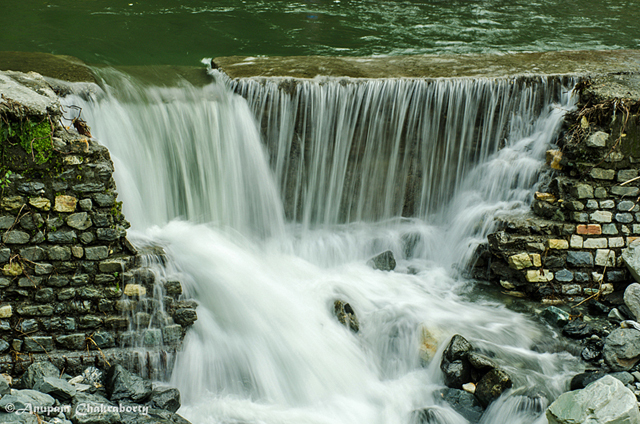 The pictures are breathtaking, especially the ones of Rudraprayag and the waterfall! Would definitely like to take this trek sometime! Hi Kulpreet! Thank you for dropping by and your nice comment! My best wishes for your trip to the valley. I think someone should create a small graphic which shows all the Prayags in one view with names of the rivers at each confluence, and how in the end we get a single ‘Ganga’. It would be a good educative/informative graphic. Anupam, I know that you are already taking a lot of time to write these beautiful logs and presenting us these out of the world photos but please see if you would want to do it. I guess even a separate dedicated post on Panch-Prayag with a real nice, detailed infographic would be worth it. Coming back to the post, the fast paced journey has took us to take of the valley. Now waiting for the treat. Dear Nandan, Yes I can do that but before that I need to visit Satopanth Lake which lies above the Badrinath Valley for the origin of river Alakananda, and also to Gomukh for the origin of river Bhagirathi. 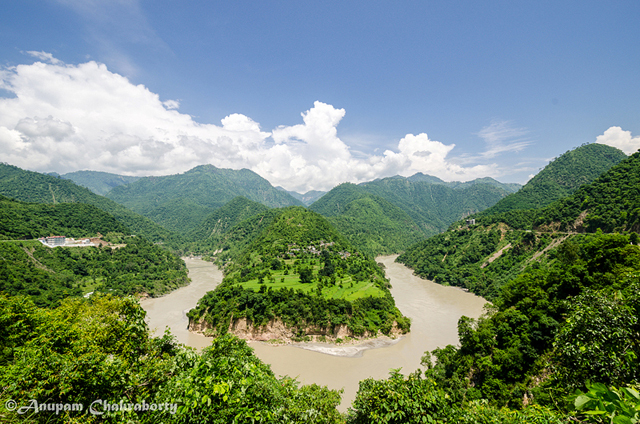 Because these two rivers are most important to understand Panch-Prayag. I agree that there can be a separate post on Panch-prayag. Thank you very much for appreciating the post and pics, Nandan! Thanks so much for sharing Anupam. Thank you very much, Snig!